It was time to get some stuff on the bare walls of this house. It was feeling very vanilla, plain, and boring. Don't get me wrong... I love vanilla. But not on my walls. Unfortunately I don't have any before shots of this wall. 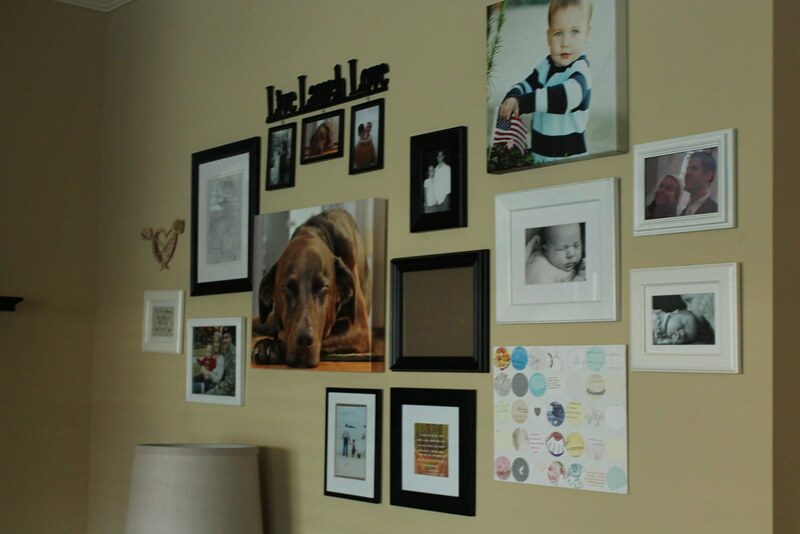 Just close your eyes and picture this wall... without pictures! I kind of haphazardly got to the finished product. My goal and "vision" were TOTALLY NOT this! It's kind of a funny story. Sit back, relax. My vision was to have a wall with a BOLD line. I love my lines. 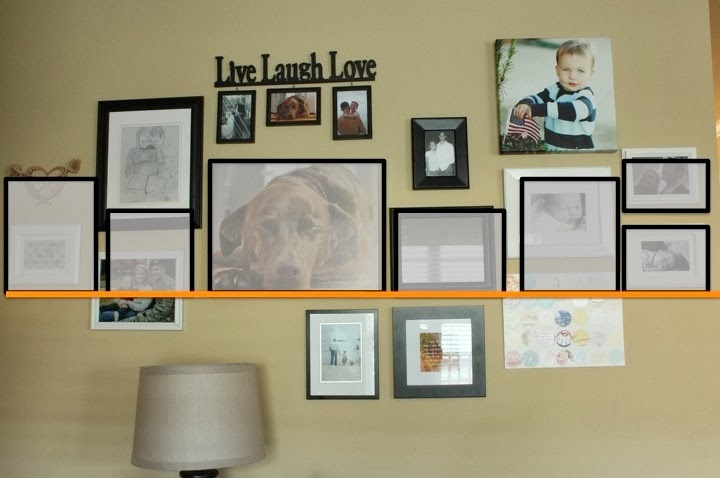 I wanted there to be one horizontal "line" (imaginary of course) and then the frames/photos popping up above it. Please excuse my "art" skills. Definitely not my strong point. I really like the look of clean straight lines. So I went for it. And really REALLY regret NOT getting a picture. It was bad. Real bad. So bad that when Josh came home he was like "Wha???!" And he usually always likes what I do. He was like "you don't like it do you?" Nope, nope I didn't. Especially after THAT comment. lol. That look "works" in a hallway because you are passing it by and not staring at it straight on. This wall that I was working with is seen from our kitchen, living room, and breakfast area. It's always in the corner of my eye. And the straight line just wasn't working. So back to the drawing board. My only issue now? I had to work around all those holes I made. We don't have touch up paint for these walls. Womp. I heard somewhere that when doing collages, to keep a heart in mind. Fitting since last week was V-day. Not to be confused with VJ day or VE day. Kidding. Totally kidding. The Social Studies nerdy jokes just slip out sometimes. 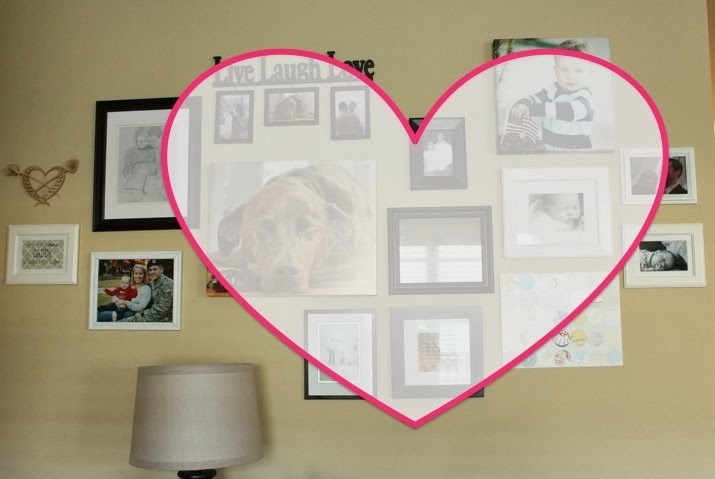 I used the heart shape method in our old bedroom and loved it. Funny that Luke's canvas ended up in the same place. Total coincidence. Since I had NOTHING left to lose I went for it. There is a little secret I keep up my sleeve when doing collages. I think it's the yearbook side of me coming out. In yearbook it was important to keep a line of focus. Can't remember the exact term, but it's easier on the eye. So while I'm arranging, I keep that "line" in mind. The large canvas of Sadie actually stayed from the first disastrous try. Then I built everything around it. Bring the bottom of the heart down and the curves of the heart up and out. 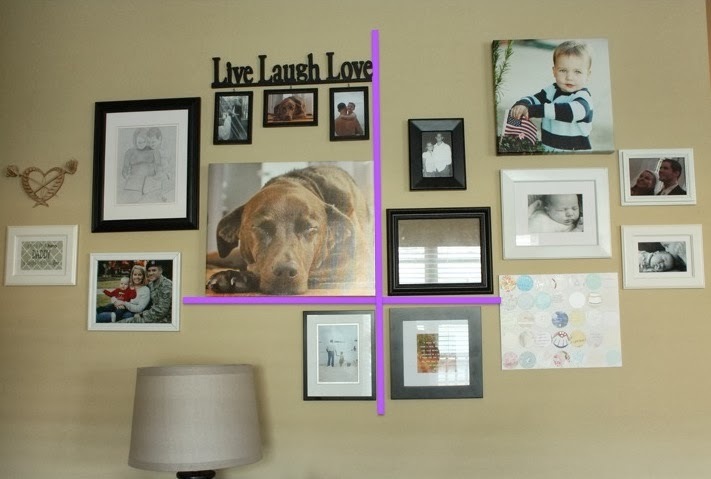 The 2nd quadrant of this "coordinate plane" was the middle of the wall. What I love the most about collages is how it incorporates everything I love. See our wedding card collage? Or the photo/poem below given to us by our dear neighbors in Toccoa? 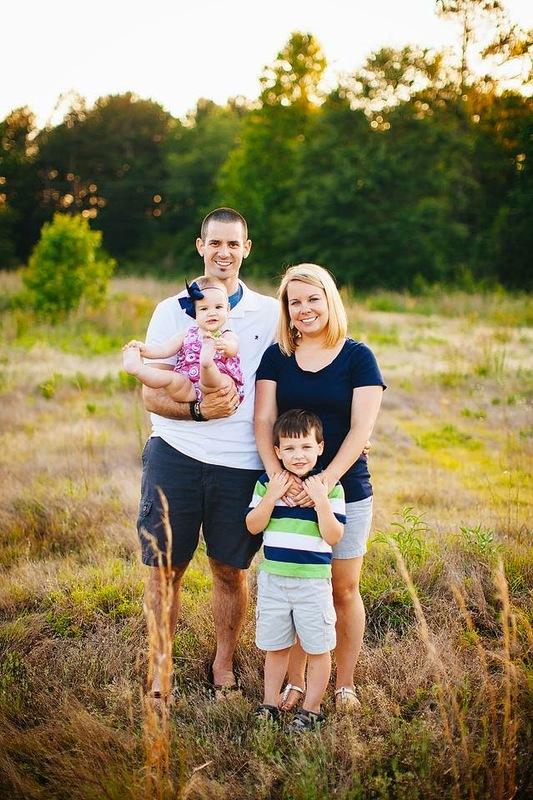 He's battling cancer and it's such a sweet reminder to pray for them daily. Or that heart that was made from weeds in Nicaragua. Josh watched the little boy make it in minutes. So sweet. I also realized how few pictures of Emberly I have printed (hence the blank frame). Also that huge picture of Sadie is duplicated in the "live laugh love" frame directly above the canvas so that will be switched out too. It took me almost 3 years to get pictures up of Luke so maybe I won't be so behind this time. Once I got that wall put together, it was time to tackle the rest of the room! And here it is today. Not totally done, but getting there. While we were snowed in Josh helped hang these shelves. We hope to eventually do built-ins in the nooks surrounding the fireplace. So until then we needed something to fill the space. We purchased a sound bar (actually 3 of them) to go under the TV. Josh wasn't impressed with the sound AT ALL from any of them. We determined it's something that we just need to spend a good bit on to get a good system. So we are going to wait. Until then, the holes will sit. We are going to lower the TV to cover the plug plates and then paint an accent wall to cover the rest (once the holes are filled). Stay tuned! I'd say it's come along way in 2 months! And I am so loving our new view! !